Our friend Andy was in town a few weeks ago. We became friends with him several years ago when he started playing guitar with Louis, but 5 years ago he moved away to finish up his Ph.D in Astrophysics. Andy is smart and funny. He's a really good friend, much more like family really. I would describe Andy as a lifelong friend. The kind of person who remains your friend through distance and long absences. Is there really any better way to catch up with an old friend than to sit out side with the grill going and a glass of wine in your hand? I think not. But for me, the star of the evening was the summer squash gratin. I could seriously just make a meal of the gratin, and I could probably polish off the entire thing myself. The squash are sliced thinly, mixed with garlic, shallots, salsa verde and Gruyere and topped with bread crumbs moistened with brown butter. The squash become tender but not mushy. There is some brightness from the salsa verde and richness from the Gruyere. There is so much going on flavor and texture wise that it is hard to stop yourself from going back for spoonful after spoonful. Cut the squash into 1/8 inch thick slices. If you have a mandoline, this is the time to use it. Toss the slices in a large bowl with 1 teaspoon kosher salt, and let sit 10 minutes. Place the breadcrumbs in a bowl. Heat a small saute pan over medium heat for 1 minute. Swirl in the butter and cook a few minutes, until it browns and smells nutty. Pour the brown butter over the breadcrumbs making sure to scrape all of the brown bits in as well. Toss well. Drain the squash and transfer to a large mixing bowl. Add the shallots, garlic, thyme, salsa verde, and some pepper. Toss to combine, and add the cheese and half of the butter coated breadcrumbs. Toss again, and taste for seasoning. Place the squash in a 9x9 inch or equivalent baking dish. Scatter the remaining breadcrumbs over the top, and bake 35-40 minutes, until the squash is tender and the top is crisp. This makes more than you will need for the gratin. Enough to spoon over some grilled Lamb. Salsa verde is more of a template than actual recipe. You can add any mix of herbs that suit your fancy. The key is for it to be bright and ever so slightly pungent. If you are vegetarian, you can leave out the anchovy. Otherwise the garlic, anchovy and capers should stay in, but the mix of herbs can change. Pound the garlic and anchovy to a paste in a mortar and pestle. Put these into a food processor with the herbs and a bit of the olive oil. Process adding more oil. Transfer the herb mixture to a bowl. Gently pound the capers in the mortar and pestle until they are partially crushed, and add them to the herbs. Stir in the remaining oil, a pinch of black pepper and a squeeze of lemon juice. Taste for balance and seasoning. What an interesting combination--salsa verde and Gruyere cheese! This gratin looks delicious. I'm always looking for things to use up that bumper crop of zucchini. And homemade mozzarella? You are a brave woman! It was amazing, still rubbing my belly. Thanks gogga. Yes, catching up with an old friend over a nice glass of wine -- perfect This recipe looks great and we all know that it is squash season. Good timing. Thanks! 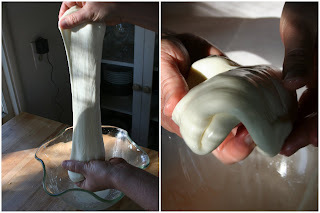 how did you make the mozzarella?! ?